But in some parts of the world, both animals are referred to with the same name. Actually, Cheetah and Tiger are different. Guess it never dawned on some people living in their bubbles that there are languages around the world that group things. My birth language there was only one word for Monkey, Dog, Cat, Lion was used for all big cats. 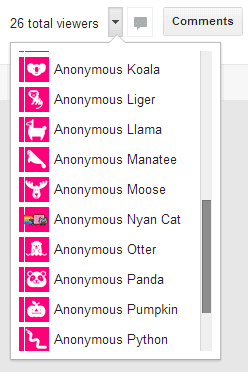 I want to know who are the anonomous people and why do they have a nayan cat!? It means people are viewing the document or the drive. Something must be set to public and they have access. I had this happen to a Google Spreadsheet late last night. Only people in our organization has access to the file. It is not shared publicly. So how is possible someone else can access it? they could possibly be accessing it via shared link while not logged in. I just had this happen.. and while confused and worried for a moment I eventually realized that I am an idiot because I had the file open in a different browser.. but then logged out of google in that browser while leaving the file open and moving back to my other browser to see that an anonymous chupacabre was viewing our company files!? oh no!? wait... no.. it was just me. 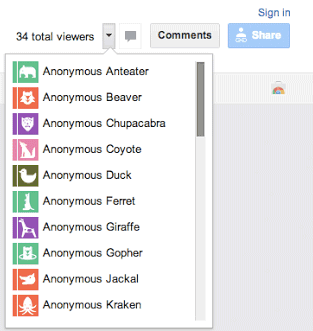 Why would Google allow an anonymous/random person to view something from the drive? What if it was supposed to be private? And how could an anonymous person view the drive? I am confused, and mad. It just said something about not seeing it. Unicorns you click on sharing when in the document, and make it available by link or publicly. If you don't allow anyone to edit it, they will be the anonymous person. I think you can make it available to edit while they're viewing it and you can see who's viewing it but that risks people screwing up your file. 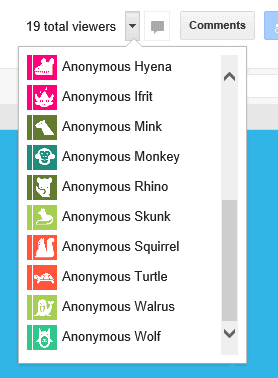 can i be an be an anonymous animal ? yes, when you enter a public document you are automaticly one. just go to the comment thing and where it says how many people are there it will say what you are. How can I prevent anonymous people to access documents? Why are you posting comments twice? Missing the Lion, the Tiger, and the Bear. Cat and dog. Also Unicorn. If the chupacabra and kraken are listed, then so should be the dragon, phoenix, mermaid, selkie, unicorn, werewolf, etc.. I love that you included selkie! 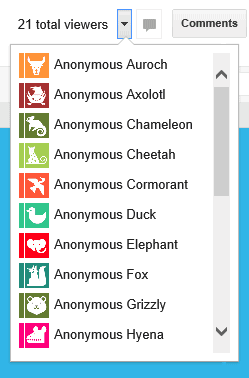 Instead of Anonymous Dinosaur, they should really have done Anonymous T-Rex, Anonymous Stegosaurus, etc. i had one on google docs yesterday. But I have it set to only allow someone to open it if they have the link, and I only sent it to one person, but now I have three anonymous animals looking at my document! Why? Trust No One! Especially that anonymous pumpkin, there's something just not quite right about that one!!! The person you shared the link with most likely shared the link to others. Share privately only. I got Anonymous Manatee -- out of context I wondered if someone misspelled Maintainee!! ur spellingest are much horribler, and me grammars are badest very. One, my birth day, Two, Google docs and Google sildes has this feature. Don't make me think! Stupid feature. hi author useful article and looking forward for more articles. when you find free time please do visit our bolg. Why does any anonymous person get to open anyone's PRIVATE FILES????????? Can someone from Google company explain, PLEASE??... I didnt get to read a thing about this in any contract. Needing some explanations. Still confused as how you do this, can you guys help me? My testimony on how i was heal on herpes by one doctor called DR AIWEKHOE. Am James bassey by name i live in zambia i suffered the illness called herpes, i have been in so many hospital's i visited so many herbalist no one was able to cure my illness,this nearly take my life, until a friend of mine introduce me to one DR AIWEKHOE i never knew the man was so powerful until i got in touch with his herbal medicine. That was when i know that there is a real DR AIWEKHOE who can cure all disease so he cure my herpes i regain back my life and all that i have lost come back to me, the DR AIWEKHOE is indid is powerful Dr. contact him to see for your self his Email is draiwekhoespiritualtemple@gmail.com +2348102960248. how do I add my email there so it wont be anonymous n so that people know I edited the document? Call me crazy, but I'm trying to find them all! Hey I read your blog.It's great blog..